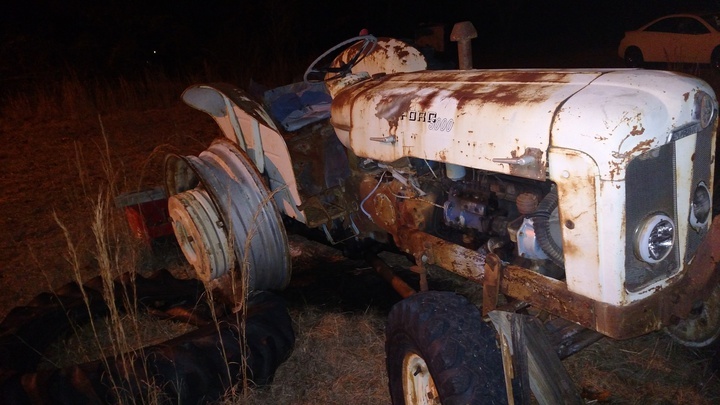 I'm going to try to post some pictures of what I have here I've had this tractor fall in my lap I really like to know more about it and what it is and maybe how much it's worth. I'm told it is not ran for the last two or three years but it's supposed to run good. It is located in Augusta Georgia USA. It's of 1964 vintage. A good general purpose tractor in its day. It's kind of hard to gamble on a tractor that doesn't run. freed up. I've got one with many, many hours, but it starts easily. Went today and checked it out very well it all looks together the oil in the engine seems to be black I guess I could drain and make sure there's no water in it before I do it. From what I gather it used to have a dozer type blade on it I can't tell how many hours it's got on it because the gauge is messed up there. It does have probably a $500 or more 6 foot box blade on the back. When you say vintage apparently vintage doesn't make it worth anymore correct. 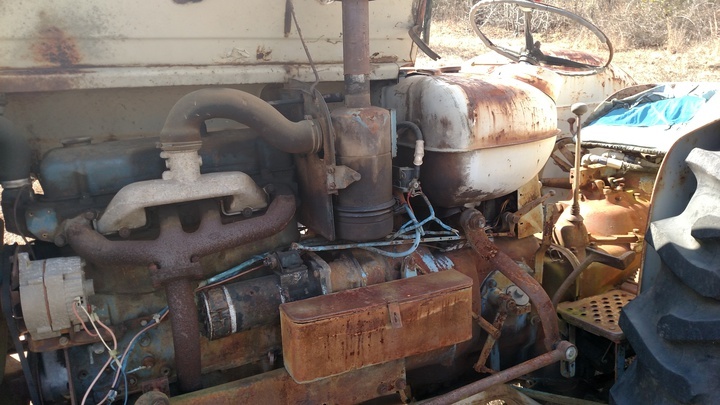 We were able to turn the fan over and the motor is not locked it moved over quite easily and the first thing we noticed is some diesel fuel leaking out of the injector front area. So I imagine if I hook up the starter with the battery imagine I'm going to have one heck of a leak there a fuel smells very funny in the tank. I also believe it's been switched over to 12 volt as I see some of the wires are cut and it has what looks like a GM alternator on it. I'm going to go ahead and post some more pictures that I took today. I think I can get the owner to sell it to me for $500 and a couple rides on my nice Harley. Not sure if I'm doing the right thing here as I don't let anybody ride my Harley both tires need to be fixed because there's riveted patches in the tops of each tire. 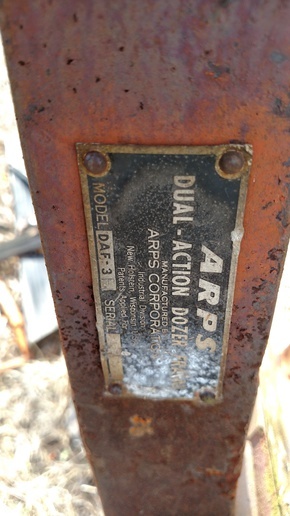 DAF-3 Dossier by ARPS parts available. Evidence of former hydrolics. they were nearly $1,000 installed.[Imports]. A little diesel seepage shouldn't bother at this point. Can probably be fixed with a new gasket or adhesive. I don't know what a southern climate does, but I wouldn't think 3 year old diesel fuel would be "bad'. My use of "Vintage" in this context is just an expression, meaning approximate. 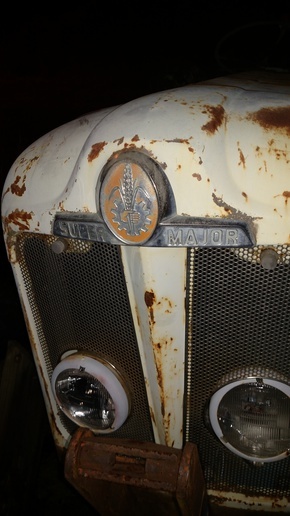 It was the last year for English Fordson tractors. They made more of them under a different name in Spain. In the area of old cars, Vintage is something like 1919-1930. I don't know if tractor guys go by that very much. And they aren't like "Vintage Wine", in that certain years are better than others, but some might be thought so. 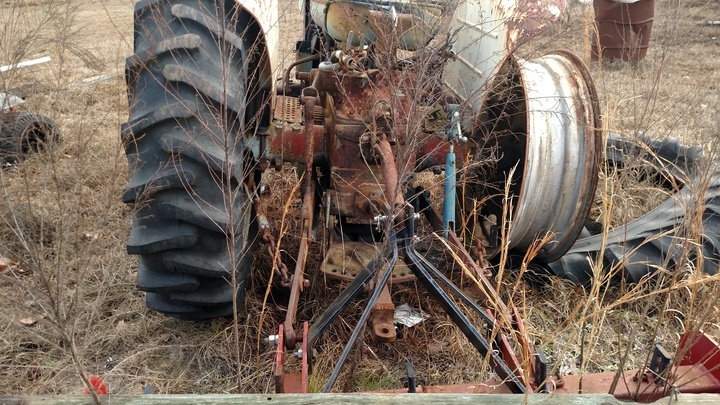 For example, the Ford 3000, or JD 4020, or Farmall M. Some may think of 1942-45 tractors as "War Vintage", since they had special features to reduce use of strategic materials. Great pictures, nice find! Make sure you change the oil in the injection pump, it takes same oil as engine as do the air breathers. (quoted from post at 17:29:59 01/29/1 Great pictures, nice find! Make sure you change the oil in the injection pump, it takes same oil as engine as do the air breathers. Your welcome, the front blade attachment would be some what collectible I would think. Is the blade kicking around there? (quoted from post at 18:15:21 01/30/1 Your welcome, the front blade attachment would be some what collectible I would think. Is the blade kicking around there? The tractor looks the same as mine but where the 5000 came from ??? Would you please send me some pictures of your tractor also I would like if you could to explain to me what some of the controls are on the left and right side and as you're sitting in the seat there are so many Libras and bars I have no idea. 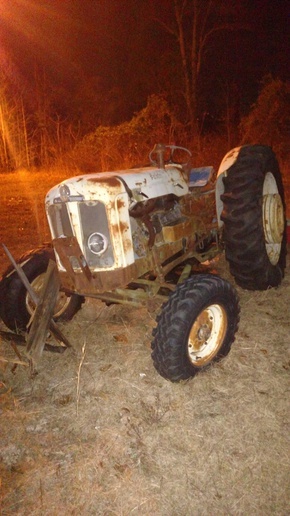 Also I want to start this tractor but I have no key and I'm not sure how to start it without a key. 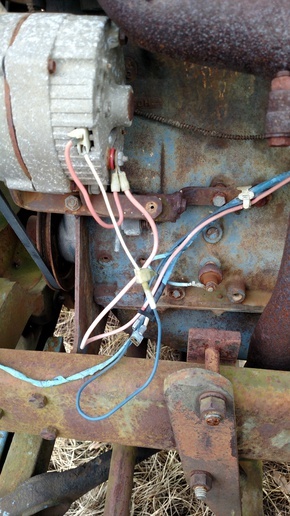 It looks as though somebody has put an alternator on this tractor and switch it over to 12 volt from its original 6 volt. That too is a little bit confusing. 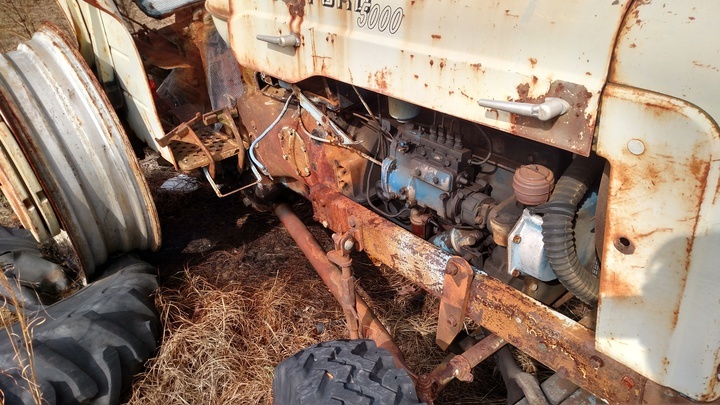 I wish somebody could tell me where the Ford 5000 came from from what I have discovered it seems as though this tractor was imported from Britain and it was right before Ford came out with their Ford 5000 so at least came off the boat Ford just put their sticker on them and sold. That's the story I'm getting I wish I could tell.